Sampadyam magazine September 2014 issue has been published and now is available for sale. This edition of the magazine covers topics including various ways to get more interests and methods to save income tax. Regular features like Side Business, Finance Doctor, Happy Life and Money Manthra keep the reading much interesting. Read more to know about Sampadyam, the most celebrated investments and financial planning magazine. Sampadyam, the most celebrated investments and financial planning magazine has published its September 2014 issue. Being one of the top monthly magazine in the genre, Sampadyam is popular among the reading community in Kerala. The highlight of the latest edition of the magazine includes articles on topics including various ways to get more interests and methods to save income tax. Regular features like Side Business, Finance Doctor, Happy Life and Money Manthra would add more interest in reading. The cover story 'Methods to get more Interest' gives an insight to investors to get high interest from deposits. Being a well studied feature, this article focuses on interests offered by various banks. Having a thorough reading would enable people to take care of their accounts to get more benefit. Adding more colours to the Onam celebrations, readers are offered with discount coupons which could be used during shopping. As an Income Tax special issue, an inventive article on the topic is very interesting. Another article on Rajiv Gandhi Equity Scheme helps people who are interested to get maximum return from their investment. Axis long term fund is yet another feature which keeps the readers intact. Taking time to read these informative thoughts would give double benefit. In the 'Business for You' section, an exclusive article on earning money by doing home business is worth for reading. Success stories of Martin Kochukunju and A C Baiju are really motivating for those who are searching for innovative ideas. The 'Side Business' segment is about Real Estate deal. 'Finance Doctor' is a section which enables the readers to get answer to their doubts regarding various topics related to Finance. The success story of Dayananth Agarwal is highly inspiring which could help the readers to live their dreams. As 'Sampadyam' also publishes arricles on stocks, mutual funds, insurance and Income Tax, it serves as an advisor and companion while taking decision on investment. Presented in a classy and simple language, this magazine keep the readers get engaged till the last page. Widely read by executives, entrepreneurs and high net worth investors, this magazine is recommended to people who wish to have a systematic living. Sampadhyam malayalam magazine credited as one of the popular periodical featuring articles on Investments and financial planning. Published from Malayala Manorama, this personal investment magazine covers features on stocks, mutual funds, insurance, and Income Tax. The magazine serves and an advisor and companion while taking decision on investment. Read more to know about Sampadyam, the personal investment advisor. Sampadhyam magazine July 2014 issue has been published and now is available for sale. The main highlights of this issue will an article '25 ways to earn profit from stock market. Credited to be one of the popular periodical featuring articles on Investments and financial planning, Sampadhyam is well liked by the readers. Sampadyam magazine August 2014 issue has been published and now is available for sale. The mega bonus edition of the current issue comes with some interesting articles, offers and free booklets. Highlighted as one of the popular periodical featuring articles on Investments and financial planning, Sampadyam is well liked by the readers. Mathrubhumi Arogyamasika September 2014 issue is now in stands. As Mathrubhumi Arogyamasika free online reading is not possible, you need to buy a copy from the nearest book vendor to read the content. This edition gives special focus on Health of Men. Alzheimer's disease and its management, Kidney diseases in children, Antibiotics in Chicken are also given with prominence. Find the most interesting articles on health and related topics in this issue of Arogyamasika. 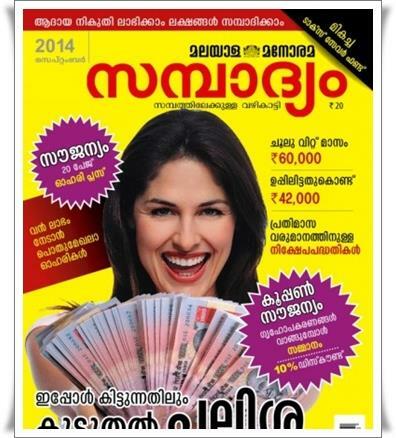 Manorama Arogyam magazine September 2014 issue is now in stands. As Manorama Arogyam September 2014 issue free online reading is not possible, you need to buy a copy from the nearest book vendor to read the content. The highlights of this edition are articles on Women's secret diseases, roof top farming, Special focus on Cholostrol = Heart Attack. Find the some interesting articles on health and related topics in the current issue of Arogyam.